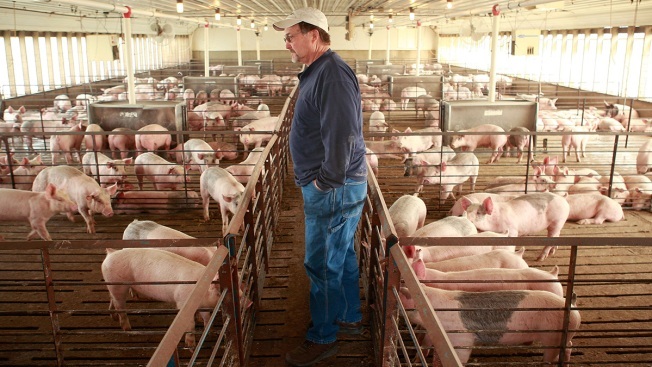 In this April 28, 2009, file photo, Gordon Lockie looks overs hogs he is raising in Elma, Iowa. Pork farmers could lose $100 million annually after Mexico said it would slap a massive tariff on pork imports to retaliate against President Donald Trump's aluminum and steel import levies, according to an estimate by the Iowa Farm Bureau. Mexico, the second-largest market for U.S. pork exports, said Tuesday it would impose a 10 percent tariff on U.S. pork shoulder and legs, with the tariff rising to 20 percent by July 5, a spokesperson for the Mexican Ministry of Economy confirmed to NBC News.